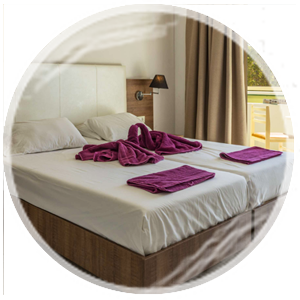 The hotel is situated just 400 from the faliraki beach. Is made up of three blocks, situated in a quiet area, but within easy walking distance of a selection of shops, bars and restaurants. The lovely outdoor swimming pool area provides a great alternative to the beach, and is a great place to unwind in the sun. Get a head start on your stay with an all-inclusive package. We provide a rich buffet full of imaginative and delicious selections. A taste of traditional Mediterranean and Greek cuisine will take you back to another time. The sun terrace is furnished with loungers and parasols, while the poolside bar serves snacks and refreshments throughout the day. For more active guests there is table tennis available onsite as well as pool-table, PS3 and a jaccuzi. The sandy beach of Faliraki can be found just 400 metres away, where you will find plenty of beach water sports activities, sun loungers and umbrellas. 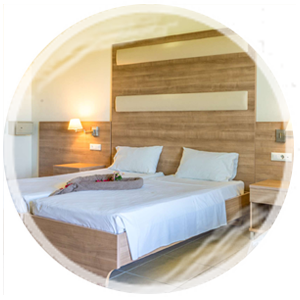 This complex of 106 rooms is in a central location, with the cafes, bars and watersports of Faliraki Beach just 400 metres away. And, when the sun goes down, the full-on nightlife of Faliraki is easily within your reach. 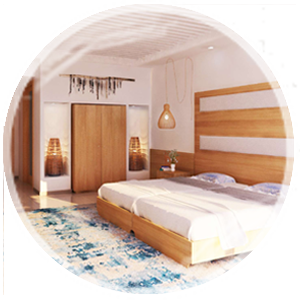 This hotel is an ideal choice for younger guests looking for a lively atmosphere. Faliraki is the primary seaside resort village on the Greek island of Rhodes, in the Dodecanese. It is situated on Faliraki Bay, on the northeastern coast, about 14 km south of the town of Rhodes and 10 km southeast of the airport. It is part of the municipality Kallithea. Unique, one of the finest in Greece. It’s an incredible 6km beach full of sand & small pebbles and azure waters. Even in the crowded period of August anyone can find a place to sit and enjoy the sun & the sea. The waters are deep & crystal-clear. Next to the beach or at the village, you’ll find traditional taverns where you can enjoy fresh fish & seafood.